There is something about the slash that is viscerally beautiful. Fully laid back, legs extended, hand dragging or planted behind—a perfect balance of power and subtlety, a combination of skill and ease that is almost art. In the snowboard world, there are few examples better than the pow surfers of Japan, and even more specifically the legendary Gentemstick crew of Niseko. 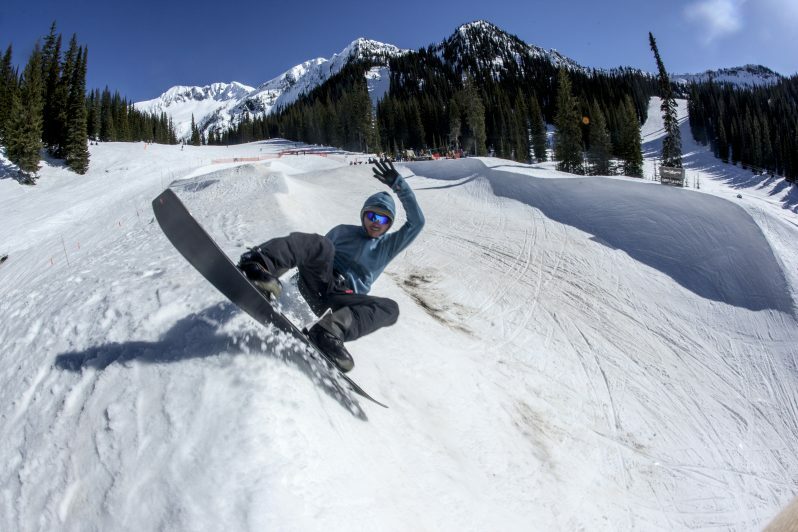 When the Gentemstick team came to Whitewater, BC, to host their first North American Bowl and Bank Session on March 30th, it was the ultimate lesson in the slash. Skateboarders have been riding empty pools and bowls for decades; the boys from Gentemstick decided it was time to bring that tradition to snowboarding, and over the course of a week—with the help of the Whitewater grooming team—they used cats and excavators (yes, the big dirt scooping kind) to shape one of the most unique snow features out there. Unfortunately, we arrived a day late and missed the actual event; fortunately, we had the course to ourselves, a smattering of locals, and the Gentemstick riders who had stayed around for a few days. It’s hard to describe the Bowl and Bank —part pump track, part park jump, part empty pool, the word that immediately come to mind is “fluidity,” with multiple flowing lines all ending in the rounded bowl. The feature exuded creativity, something that both the locals and Gentem team were taking full advantage of. The feature was built on lower Sluice Box, visible from the lodge and surrounding chair—a good thing, because as locals and visiting pros laid back their own signature slashes, airs and handplants, the view was mesmerizing. In the dictionary of snowboarding, it was the definition of slash session. But the Bowl and Bank course wasn’t the only impressive view—the stunning and massive terrain surrounding the area stood tall and shimmering like snowy knights in rocky armor. Couloirs, cliffs and chutes fell from ridgelines down into Whitewater’s famous trees, providing slushy turns from top to bottom. As the bowl junkies sent their flow lines, locals also sent huge big mountain lines—winter, it seems, isn’t over at Whitewater, at least not if you’re ready to hike for some turns. As the day wound down and legs tired out, some shredders made their way into Whitewater’s legendary lodge (they have three cookbooks) for an après-shred meal and beer out on the deck, while others kept the dream alive to the very end—well, until they found their nearest empty pool or breaking wave, fully ready to host some slashes of their own.